A serious bacon lover might tell you jokingly that “even bad bacon is pretty good,” but that’s not at all true. Bacon is just as prone to spoilage as any other kind of meat, and eating bacon once it’s gone off can leave you feeling really, really miserable for a day or two. When your bacon gets elderly, you need to worry about two different kinds of threat. One is spoilage bacteria, the kind that make it look and smell weird. Also worry about what scientists call “pathogens,” microorganisms like salmonella, listeria and Staph. aureus, the ones that can make you really sick. 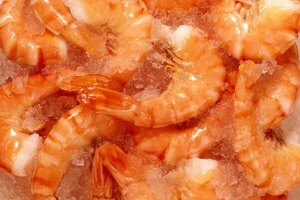 Spoilage bacteria are pretty easy to detect. If you take your bacon out of the fridge and notice that it has a weird, sickly, sweet-sour smell rather than the usual meaty, smoky aroma, that’s a clear warning. If the bacon gives your fingertips a tacky, sticky feeling, or if it’s visibly slimy when you separate the strips, those are both sure signs of bacterial activity. You should definitely toss the bacon. Color isn’t quite as clear a sign. Bacon that looks gray or green is definitely past its prime, and it should be discarded. If just the slice closest to the package opening has gone a bit faded and beige rather than pink, that can be a sign of normal oxidation. If the remaining slices have kept their color and you don’t detect any odd smells or textures, and the bacon is well within its shelf life, it should still be perfectly fine. It’s up to you whether to enforce the “when in doubt, throw it out” rule. Spoilage bacteria can definitely upset your stomach and possibly your digestion, but they’re not the ones you really need to worry about. The ones that’ll really mess with your belly ‒ and sometimes be fatal ‒ can’t be seen or smelled or tasted. That’s what makes “bugs” like Listeria monocytogenes or Staphylococcus aureus so dangerous. You need a well-equipped laboratory to know for sure if they’re there, so the smart answer is to assume they are and treat your bacon accordingly. Make sure the bacon you buy is within its specified “sell by” or “use by date,” which gives you some idea of its freshness. Don’t buy packages that are discolored or no longer sealed. 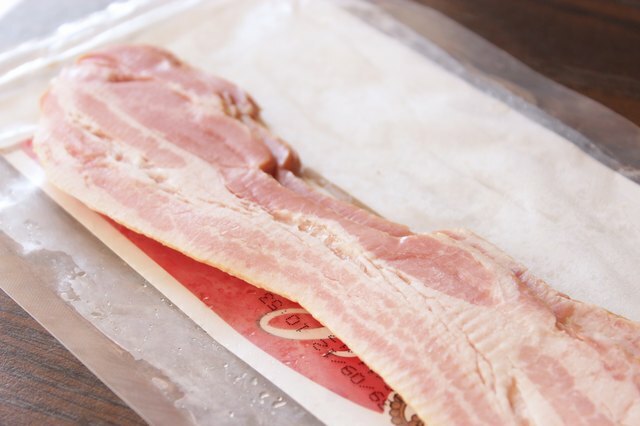 Keep the bacon cold on the way home, using a cooler or insulated bag if you need to. Store it in the fridge or freezer when it’s not in use. If you’re thawing a slab from the freezer, put it in your fridge overnight instead of leaving it on the counter. 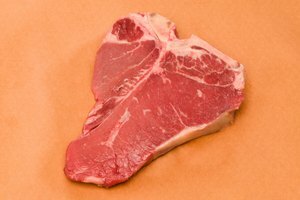 This is all common-sense food handling, and it applies to bacon as much as to other foods. Spoiled bacon symptoms are much the same as for any other foodborne illness, usually including some combination of nausea, vomiting and diarrhea. It’s hard to know for sure what made you ill, because the odd-tasting tuna sandwich might have been perfectly innocent, while that extra-tasty piece of bacon was actually loaded with pathogens. Good food handling habits are always your best defense. What About Other Kinds of Bacon? You might well wonder why your bacon only lasts a week in the fridge, while the pioneers carried theirs for months on a covered wagon and (mostly) survived. The answer is that those old-school slabs of bacon were dry-cured, a process that used salt, nitrites and water loss to make the bacon inhospitable to bacteria. Dry-cured bacon will last up to 10 days outside the fridge if it’s sliced, or up to 3 weeks in slab form. In the fridge, it’s good for at least a month. There’s also “shelf-stable” bacon, which is sold at room temperature in sealed packages. It’s got a low enough water content to be safe from bacteria until it’s opened, but once it’s open, it should be refrigerated and used within a week or so. Both of these kinds of bacon will eventually become funky as well and should be discarded when they do. 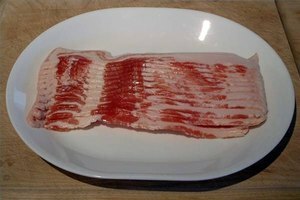 The nitrites in bacon can produce carcinogens as they break down, so some consumers try to avoid that by using bacon made with “natural” curing products such as celery powder instead. These can and do cure the pork, but they’re not as safe and reliable as commercially produced nitrites. 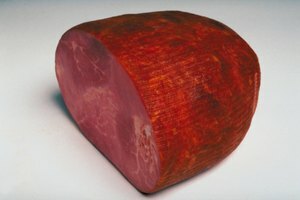 Additionally, the USDA doesn’t endorse their use for long-storage, dry-cured bacon. Ironically, the reason these ingredients work to the extent they do is that they contain nitrites of their own.